Both king and coho salmon are notorious for being found in deep water. Deep is a relative term, because what amounts to deep water in a fisherman’s mind and the depths that salmon call home are often fathoms apart! 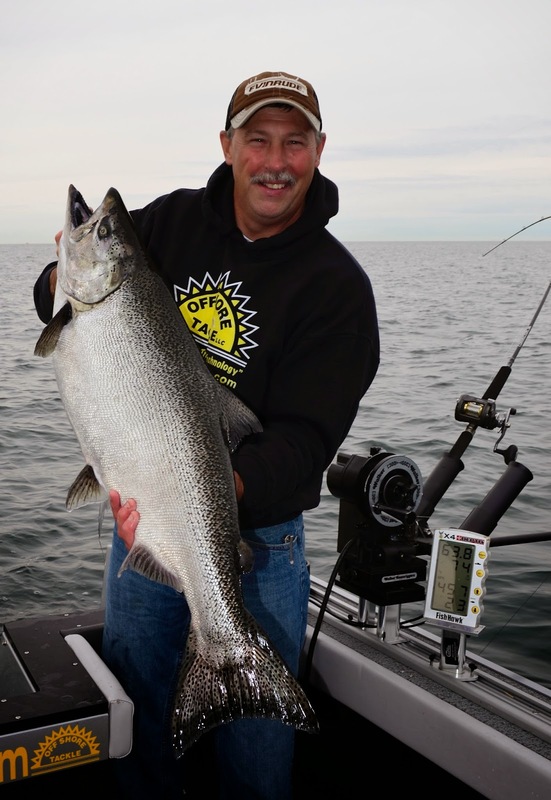 King and coho salmon are most often caught in the Great Lakes from 40 to 100 feet below the surface. In part this is because modern fishing methods are limited to some extent to fishing this depth range. Ironically salmon are capable of surviving and thriving several hundred feet below the surface! During the last two decades the Great Lakes have endured some amazing changes. Most noteworthy the rapid expansion of the zebra mussel has made a profound impact on both water clarity and the amount of plankton found in the water column. This evasive species survives by filtering nutrients and plankton from the water. Collectively the countless zebra muzzles in the Great Lakes consume so much plankton, they have actually changed the dynamics of the Great Lakes starting with the building blocks of the forage base. Forage fish depend on plankton as the foundation of their food requirements. With less plankton available in the system, forage fish are forced to travel more in search of food and also to seek out food resources in deeper water. These changes also impact salmon as they are in turn forced to hunt harder and to seek food in deeper water. base of the Great Lakes. Filtered water is clear water and fisherman are also faced with fooling salmon into biting artificial lures that can be seen clearly and easily scrutinized. It’s always tougher to fool fish into biting when targeting them in exceptionally clear water. Not surprisingly the majority of the salmon being caught are taken early and late in the day when low light levels prevent salmon the luxury of seeing every detail. This witching hour takes place twice a day and any salmon angler worth his trolling spoons is on the water at these key times of day. It’s well known that salmon have preferred water temperature ranges. Most seasoned salmon anglers feel that water temperatures in the 40 to 55 degree range represent the salmon’s preferred haunts. By using a temperature probe on a downrigger such as the popular Fish Hawk (www.fishhawkelectronics.com) it’s fairly easy to pinpoint at what depth these preferred temperatures occur and zero in on the best water. The Fish Hawk also provides critical trolling speed at depth, making this piece of electronics invaluable to the salmon troller. What isn’t widely known is that salmon in recent years have been forced by environmental changes to feed outside of these recognized comfort zones. Captain Lee goes on to explain that in low light conditions salmon will temporarily leave their deep water haunts and water temperature preferences to feed on forage found in warmer waters closer to the surface. 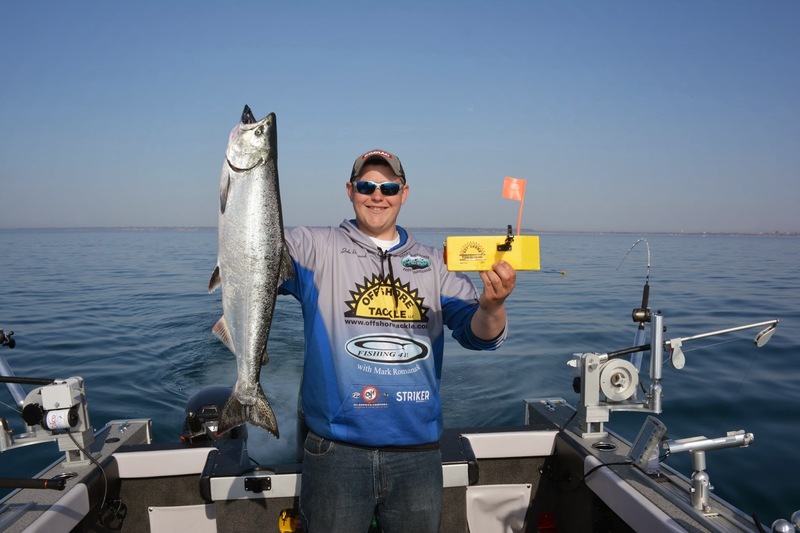 salmon fishing all across the Great Lakes region. It’s almost like a magical switch that controls feeding activity is turned on a half hour before the sun rises and turned off about thirty minutes after the sun pops above the horizon. After the morning bite ends, it’s futile to continue fishing in warm water. The fish simply retreat to deeper and much cooler water. The duration of these feeding forays into warm water vary from day to day, but rarely last more than an hour or two at most. On calm and sunny days the bite is very brief. On windy or overcast days the bite stretches out a little longer. Typically this feeding frenzy is so short in duration that it’s hard for a salmon fisherman to catch more than five or six fish before the bite is completely done! Half a dozen salmon in a morning is pretty good action for a recreational angler, but a charter with five or six customers aboard needs to catch two or three times that many fish to satisfy his clients. This is precisely why the most astute charter captains have learned how to milk additional salmon from deep water as the sun rises and the day progresses. While salmon are often characterized as “pelagic” or free swimming fish, these salmonids are profoundly influenced by bottom structure. While salmon are commonly found suspended in the water column, these suspended schools of fish are often suspending near some type of bottom structure. Bottom structure attracts bait fish which in turn attracts salmon. Also water moving around these structures creates some unique surface and subsurface currents that also influence on salmon feeding habits. Throughout most of the Great Lakes the near shore waters experience a gradually sloping contour. In a few places that gradual sloping bottom drops off sharply forming an almost vertical wall descending into deep water. In some other places, significant depressions in the bottom hold fish in a specific area. In Lake Michigan, the area near the tip of Big Sable Point north of Ludington, Point Betsie north of Frankfort and the “shelf” area straight out from Manistee are good examples of shoreline structures that routinely concentrates salmon. The Herring Hole south of Frankfort is an example of a depression that also concentrates fish. On Lake Huron similar rapidly sloping shelves occur at Oscoda and Alpena. In Lake Ontario, places like the Niagara Bar near the mouth of the Niagara River provide salmon the comfort of structure and nutrient rich waters that also attract and hold bait fish. After the morning flurry of activity salmon start moving to deeper water. Fish that were feeding actively at first light from 40 to 100 feet down and along the edges of structure, quickly slip down to 100, 200 or even 300 feet of water by eight or nine o’clock in the morning! Reaching these ultra deep fish is a little challenging, but they can be caught by being persistent and moving forward with a deep water strategy. The electric downrigger equipped with at least 300 feet of cable plays an important roll in targeting salmon deeper than 100 feet. Rather than the standard 10 pound downrigger weight, lots of captains are using 12 and even 14 pound canon balls to fish this deep water. A boat equipped with two electric downriggers is ideally rigged for targeting deep water salmon. Adding more riggers doesn’t necessarily improve fishing success. A better approach is to use other presentations to incorporate additional trolling lines. Using wire line to fish diving planers is another method that helps to reach fish found in deeper water. Wire line fished in combination with the largest sizes of diving planers like Lurk’s 124mm Disco Diver allow angler to target fish as deep as can 100 feet down. Achieving these ultra deep depths requires setting divers back 200 to 300 feet, which in turn requires a reel capable of holding at least 600 feet of 30# test stranded wire. The Okuma Catalina series line counter reels in the 30 and 45 series sizes are ideal for wire line fishing. This reel must be matched to a roller style rod that can handle the abuse of wire line. I’m currently using a private label rod produced by Okuma called the Big Lake Tournament series that features a swivel/roller tip ideal for handling wire line. Copper wire fished as a sandwich between a fluorocarbon leader and backing of spectra braided line is another common method anglers employ to target deeper salmon. Copper is tricky stuff as it is very dense and sinks quickly. For best results copper line should be deployed with the bait clicker engaged so there is some tension on the line as it is played out. This helps to keep the copper line from sinking to the bottom and the lure dredging up zebra mussels before the line is even ready to fish. The most common set ups of copper line include 300 feet and 400 feet of 45# test material, but some hard cores are fishing as much as 600 feet of copper line. The drawbacks to copper are many. It takes an extra large reel to handle all that copper line. Secondly, copper has a tendency to kink and unravel making it tough stuff to work with and keep working properly. to saturate the water column with lures. 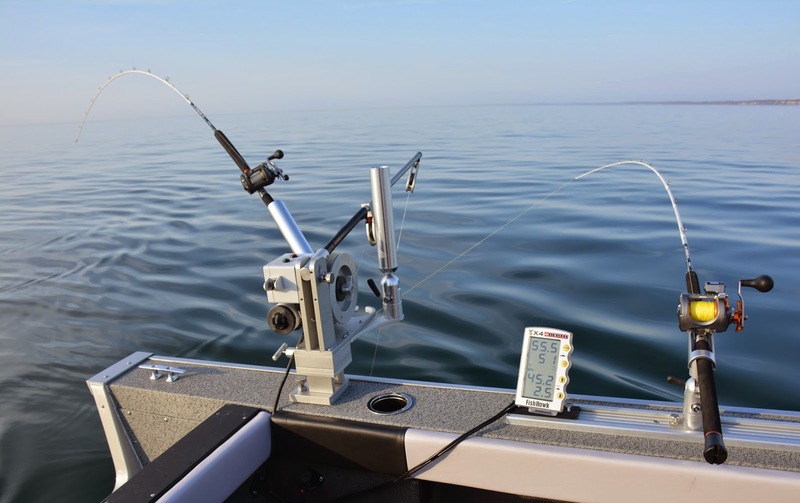 Once the copper line is all played out, the preferred way to fish this rig is with an Off Shore Tackle Side-Planer board rigged with a Snapper line clip on the tow arm of the board. The Snapper is designed to hold spectra braided lines securely. Stacking two or even three copper lines per side helps to flood the deeper water column with various lures. Magnum Tadpole Divers are an excellent alternative to fishing copper line rigs. Manufactured by Off Shore Tackle, the Magnum Tadpole is non-directional and can be fished as a flat line or in combination with an in-line planer board. Like other divers on the market the Tadpole is generally fished by attaching a leader approximately the length of the rod behind the diver. What sets the Tadpole apart from other divers is this product can also be rigged to be fished in-line by simply attaching an OR14 (black) release to the tow arm of the diver and an OR16 (red) Snap Weight clip to the back of the diver. Rigged in this manner the angler can let out his desired lure 20, 30 or even 50 feet before attaching the diver to the line. When a fish is hooked, the line pops free from the tow arm release and simply dangles on the line via the OR16 Snap Weight clip. The angler simply reels in the fish until the Tadpole can be reached and removed from the line, then continues to fight the fish to net. The Magnum Tadpole rivals the running depth of copper line rigs, but doesn’t require those excessively long trolling leads or the need to use designated rods and reels. To get the maximum depth from Tadpoles, Off Shore Tackle recommends spooling up with 30 to 40 pound test super braid line when rigging Tadpoles at the terminal end and 17# test monofilament when rigging Tadpoles in-line. All the common salmon hardware and lure options catch fish in combination with downriggers, wire divers, copper line rigs and Tadpole Divers. Some of the more popular options include Silver Horde plugs, Wolverine Silver Streak spoons, Dreamweaver Spin Doctor attractor/fly combinations and the new kid on the block are cut bait rigs. The beauty of cut bait is it can be fished with all the common salmon presentations and it can also be fished with and without a wide variety of attractors. Most cut bait rigs function in a similar way. A plastic head accepts a whole or cut piece of frozen herring, alewife or shad. A toothpick is typically used to pin the herring into the plastic head and a leader with a single hook or single treble hook is positioned along side of the cut bait. The shape of the plastic head causes the herring to spin when trolled. Of course, this basic cut bait rig can be fished as is with the help of downriggers, wire divers, copper line or Tadpoles. Most anglers however are adding other attractors to the cut bait rig. The most common is a three foot long teaser that incorporates several small but colorful mylar teaser flies. Attached to this teaser is a Spin Doctor type rotator or paddle rotator like the Luhr Jensen Coyote. The cut bait rig replaces the trolling fly normally fished on these attractors. A lot of salmon trollers are incorporating cut bait rigs into their normal trolling program. Some even say that cut bait works best when multiple rigs are fished at the same time, the theory being that increasing the amount of scent in the water creates a stronger desire to feed. Cut bait isn’t likely to replace traditional salmon trolling tackle, but it does work and certainly helps anglers target fish in deeper water and at times of day when catching fish is more challenging. The most important point is to understand that salmon are moving up and down in the water column at different times of day. Early in the morning before the sun hits the horizon traditional salmon methods and locations are producing nicely. Later as the sun gets up, it’s increasingly difficult to catch fish using the standard methods. Relocating to deeper water and concentrating on fish found holding in cooler bands of the water column is a good starting place. While these deep fish may not be feeding actively, they can be caught by incorporating some gear changes and by a little old fashioned persistence!